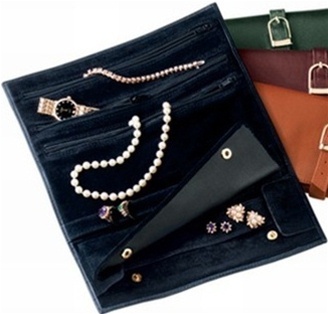 Leather Jewelry Boxes are a sleek jewelry storage solution for both travel and home. Available in large to small styles and in every color imaginable, leather jewelry boxes are most popular among men for jewelry storage at home, and most popular among women for jewelry storage while traveling. Many leather jewelry boxes are made specifically with men in mind. 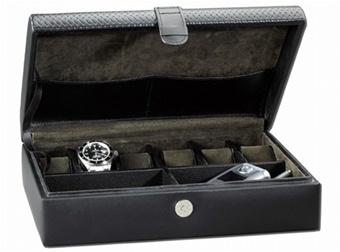 RaGar manufacturers a handsome leather jewelry box with a place for six watches plus storage for cuff links, keys, a cell phone and more. The sleek design is accented with a masculine basket weave lid. Measuring approximately 11" long x 8" wide x 1 1/2" tall, it will easily fit on a dresser top or bedside table. 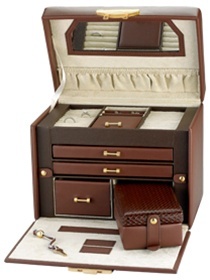 Women's leather jewelry boxes are made with unique storage features to secure all varieties of jewelry from brooches to necklaces. A luxurious European model by RaGar is finished in fine leather with stylish basket weave accents and contains ring rolls, divided jewelry sections, covered jewelry storage and drawers. There is a mirror in the lid and an inner tarnish resistant lining helps keep jewelry in perfect condition. Featuring a key lock for security and a carry handle, this case is suitable for home use or for traveling with a large collection of jewelry. Available in black or brown, it comes with a removable travel mini case. For short trips and weekend getaways a personalized travel jewelry wallet will keep your jewelry organized and within easy reach, slipping easily into a purse, carry on or suitcase. Through February 28th, enjoy 10% off all our leather jewelry boxes, travel cases and watch boxes with coupon code VALENTINE.